Although there is a multitude of weapons systems available, our extensive research and testing revealed that the AIM-9 Sidewinder heat seeking air-to-air missile was the best tool for the job. First fired in 1953, and designed primarily for fleet air defense, this missile was used extensively in the Southeast Asian conflict. The weapon has been improved steady over the years, with the AIM-9M being the latest model, which costs approximately $58,000 a pop. Earlier models such as the AIM-9L or AIM-9P may be available for your boat, but you are going to loose some features such as reduced smoke and enhanced resistance to both electronic and infrared countermeasures. The targeting system immediately acquired the target and the missile was launched. The tracking capability of the weapon was impressive. As we passed the explosion, we assessed the effectiveness of the weapon, which was nothing short of amazing. The PWC had been reduced to some flaming wreckage at the intercept site, which was surrounded by a 500 yard "debri field" being rained upon by burning bits and pieces. Our second test was performed with the objective of assessing the long range capabilities of the weapon. 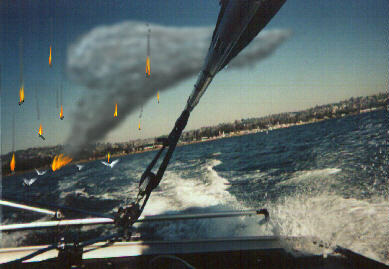 The "Crispy Critter", skippered by Frank "Nine Fingers" Pineau, was stationed in the targeting zone as an observer craft. 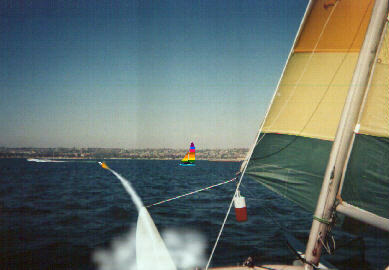 With a PWC sighted off of our port bow, and Frank to starboard, we acquired the PWC and fired. For reasons not entirely known, Frank decides to light up a cigar. At this point it was apparent that the tweaking of the missile's heat seeking sensitivity was to be our downfall. Frank starts shouting and waving his arms madly, the whole time holding the lit cigar in his hand. 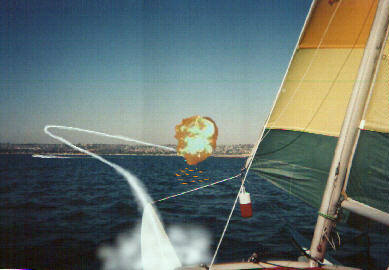 Other than the part where we blew up Frank's boat, our experience with the AIM-9M was overwhemlingly positive. 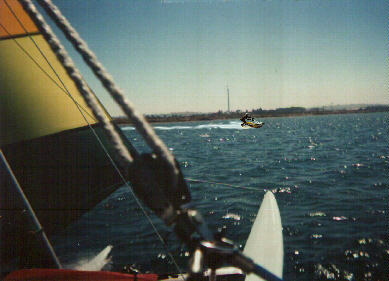 Frank was able to jump clear just before impact, and was quickly rescued. Due to the extreme heat detection sensitivity required to target PWCs, considerable care should be excercised regarding the environment in which these weapons are used. 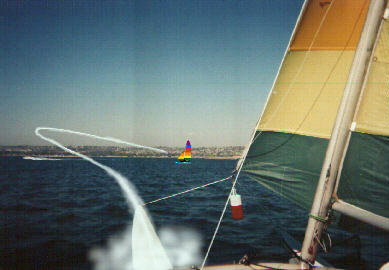 Nearby barbeques or cigar smoking sailors can quickly interfer with targeting. 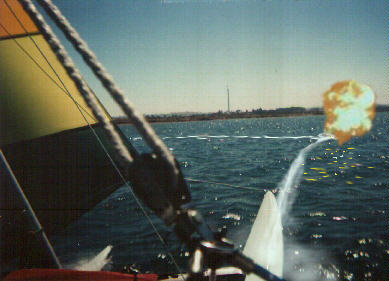 Nothing ruins a nice shrimp barbeque quicker than an incoming errant missile. In our case, we blew up a Hobie 16, scorched a perfectly good Hobie baseball cap, and hopelessly "soiled" a really nice pair of burmuda shorts. vacated the area within seconds, presumably to avoid a similar fate and/or to summon local law enforcement authorities. In our case, the authorities displayed significant anxiety, which was later tempered when they learned that the target was a PWC. 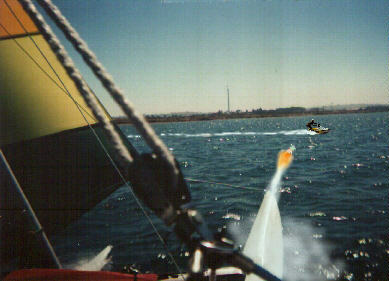 One of the officers present was noted to have said, "So the guy has a couple of air-to-air missles on his boat. What do you expect us to do about it?"